24x24x2 Titan-Mist Stainless Steel Moisture Separator | Air Filters, Inc.
Air Filters, Inc.™ Titan-Mist Eliminator™ Stainless Steel Moisture Separator are built with corrosion resistant materials and serves two important functions. The primary function of mist eliminators are to collect water droplets and oil mist from an air stream and divert the liquid to an appropriate drain. The mist eliminators also functions as a washable, low-efficiency particulate filter. The Titan-Mist Eliminator™ Stainless Steel Moisture Separator is designed for use in outside air ducts; side access housings and built up filter banks. Performance - The recommended operating range for the Titan-Mist Eliminator™ is between 450 to 550 fpm face velocity. At this range, the filter is 98% efficient with liquid droplets of 20 micrometers. The moisture separator also functions, as a low efficiency particulate filter causing an increase in pressure drop as the filter becomes dirty. Allow 0.5” W.C. static pressure for fan selection calculation. Installation Considerations - Install the Titan-Mist Eliminator™ in an outside air duct or in the primary filter stage upstream from particulate filters. It may also be installed in built-up banks made of holding frames with drain pans installed on each horizontal row, or in side-access housings equipped with drain tubes. 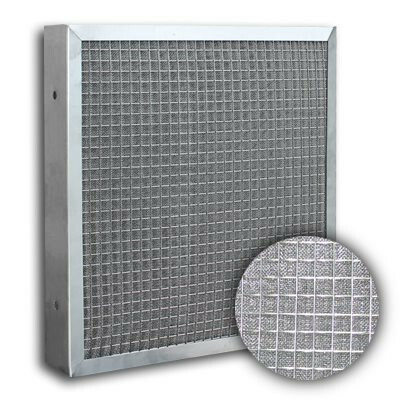 Construction - The Titan-Mist Eliminator™ filter uses a Stainless Steel frame to enclose the filter media. The corners are mitered, and the frame is secured with pop rivet(s) 3/8” diameter drain holes are punched on the bottom of the frame and a label describing proper position for drainage and airflow is affixed at the top of the frame. The media consists of multiple layers of corrugated and flat screen wired assembled with the screen corrugation positioned vertically for efficient drainage, placed between two grids. The media is made to fit firmly inside the frame giving the Titan-Mist Eliminator™ its exceptional strength and durability. 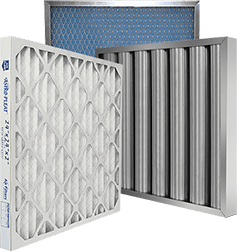 To gain top efficiency from your Air Filters, Inc.™ Titan-Flo™ Stainless Steel Frame Foam air filter simply dust off excess dirt, flush under hot water, allow to dry and replace. A mild detergent can be used if required. However do not use oils, adhesives, house hold cleaners, industrial cleaners or alkali solutions as this will damage the filter. AFTER CLEANING TAKE CAUTION TO ALLOW THE FILTER TO COMPLETELY DRY BEFORE RETURNING TO SERVICE. FAILURE TO DO SO WILL VOID ANY AND ALL WARRANTIES.